Y’all, it’s been fun featuring other talented bullet journal folks on the blog – you get a taste of how other people bullet journal for their own needs, plus it’s helpful for me as a blogger during the craziest times of the semester (grading research paper drafts is NO. JOKE.). This week is no exception to my excitement- Alec used to work with me at my day job and he is a talented and passionate advocate for social change in the world. When he told me he was bullet journaling I knew the world was in for an artistic and *real treat. Enjoy – perhaps it will resonate with your story too. Two years ago, I found myself in a metaphorical locked room with the walls & ceiling crumbling down around me. My purpose was dwindling, my long-term relationship was over, college was becoming overwhelming, and I felt that I had no control over the things that were happening around me. In my time of struggle, I had a friend recommend looking into making a list of goals for my future. Their suggestion was made in hopes that I would use these goals to highlight the possibility & positivity in my life. I spent an entire morning drafting a list, and by the end of it I felt refreshed, hopeful, and ready to change my outlook on my situation. Throughout the next semester, I spent my time exploring new ways of jotting down goals and weekly to-do items. I found that investing a few minutes each morning to brainstorm my daily goals was a form of meditation that worked for me (I had tried yoga and realized very quickly that it wasn’t the most effective way of centering myself). It gave me a sense of control over my day, even if things happened that I couldn’t foresee (life tends to do that!). It wasn’t until I noticed the work of my previous co-worker Jessica that I realized the things I had been doing had a name: Bullet Journaling. My style of bullet journaling has transformed and grown over the last two years, which reflects the growth in my own life and the curiosity I have for the world. Some people prefer to stay with the same layouts for each month, which I respect and admire – it takes commitment and skill to find a style that works perfectly for you! However, I’ve find inspiration in new posts by bullet journalists every day and love adapting different styles or techniques in the planning I do to reflect that inspiration. The posts I do differ vastly week to week, which I attribute to my changing mood and shifting needs for my mental health. The amount of growth & self-discovery I’ve been able to explore through bullet journaling has elevated my spirits exponentially, changed me as a person, and allowed me to be more productive in all aspects of my life. 1. Journal Consistently: Make sure to journal thirty minutes every morning when you wake up. The repetition will assist in establishing a routine for you to follow, and taking thirty minutes every day to focus on your daily goals will help center you for the rest of the day! 2. Set Up A Mood Tracker: I use a mood tracker to see how my mood fluctuates based on the time of day, the weather, and what I ate that day. I keep track of weather & food every month on separate tracker pages, but when combined they assist in my “end of month” reflection! 3. Set Up A Gratitude Log: Something that kept me positive when I was feeling depressed was a gratitude log. Ending each day by writing “I’m thankful because” lifted my spirits and allowed me to reflect on why I loved that day. Even on the tough days, I found myself writing things like “thankful to be alive today”. There is always something to be thankful for, even if some days it might be hidden a little bit more! 4. Don’t Be Afraid To Get Creative: Many people prefer the minimalist style of bullet journaling. Many people prefer to use color illustrations on their bullet journal spreads. Why not use both? I’ve found using both helps me feel more creative, expands my mind, and allows me to get out of my head when I feel my anxiety creeping in! 5. Don’t Strive For Perfection: Trying to get the perfect page? Don’t do it. It doesn’t exist! Your bullet journaling shouldn’t be perfect – I spent way too many days stressing over the quality of my spreads before realizing it was stressing me out more than it should be! Some of my favorite spreads have emerged from making a mistake and working with it instead of starting over! 6. Share, Don’t Compare: It can be easy to compare your work to other people’s spreads on Instagram and Pinterest, but what good does that do? If we spend time comparing instead of sharing, we are losing our potential to connect and create a deeper & more meaningful online community. Everyone’s work is different, everyone’s style can be unique, and your spreads are valid and important! 7. Embrace The Community: The bullet journaling community is amazing! Since posting my work, I have discovered how many people are supporting one another and are lifting each other up based around their love of the “bujo”. I’ve been a part of many communities over the years, but nothing has compared to the support I have found within the bullet journaling community. If you feel lonely or isolated, reach out to other bullet journalers – you may surprise yourself with the new connections you’ll form! Thank you for reading my reflections on bullet journaling – if you are struggling with mental health I hope you find something in my post able to assist you! Together we can remain strong and find the light even on days where there seems to be only darkness. If you’re just starting out as a bullet journalist I hope you can incorporate a few of my ideas into your journals! If you are already established, I hope you continue and find time to reflect on your own journey – I found it to be quite an experience. Do you think the bullet journal has helped give you peace of mind and helped your mental health? I’d love to hear your story below! This is so good and really motivated me to get back into the habit of writing lists and making goals! Bookmarking this because I need it! I struggle with mental health as well and I will try out the options you recommended here! Lately my BJ became kind of neglected and stale to me. I only scribble out the weekly and plaster it with stickers but it doesn’t feel right to me anymore. I want to make the time and effort and see what I can put into it that will help me in the future. Excellent article. The BuJo had a similar effect for me. I was suffering from memory loss connected to a head injury I suffered in Iraq and due to the stress of my job. I discovered the BuJo method and began to implement it into my daily routine, immediately seeing results. Decrease in stress, uptick in productivity, happier outlook on life, even more energy. Due to a change in life, I’ve stopped using a BuJo, but I can feel all those benefits slipping away. I need to get back into it. Great post. Having suffered with depression, I find my bullet journal is a touchstone to let me know I am still ‘up’ and focused and heading in the right direction. I also find working in my Cujo to be therapeutic, and I love many of your suggestions. The Gratitude log has also helped me find a sliver of positivity on bad days as well. Thanks for sharing your story! Your journals are so beautiful! I feel truly inspired. Thanks for sharing your creativity. Xoxoxo. I just stumbled across this post and I’ve shared it with a community that I have on Facebook called “Attitude of Gratitude with Chronic Pain!” Many of our members struggle with anxiety, depression, or other mental health related issues and we talk about gratitude journaling quite a bit, but have never gone into the area of bullet journaling and I love what you had to say and I think our members will as well. Great stuff! Thank you so much for sharing your truth & talents. I have a blog myself called Gratitude Addict and I may decide to share it there as well at some point. You’re doing wonderful work! 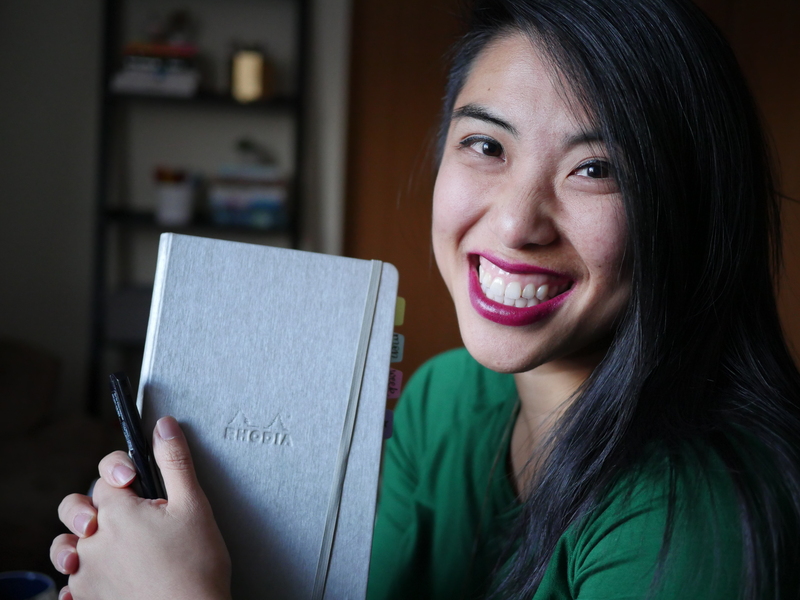 I just wanted to give you a very early update that your article is a big HIT in the group and you’ve inspired several members to start bullet journaling! Yay YOU! Those of us with chronic pain tend to get something called ‘brain fog’ so reading or writing long pieces tends to be overwhelming for us at times. Breaking it up into bullets is brilliant!! Thank you! I just came across this post and had to laugh at what has now happened over time. YOUR article on bullet journaling started a whole thing with my group……we now have a separate satellite group SPECIFICALLY FOR BULLET JOURNALING with chronic physical & emotional pain!!!! Honestly, when I read your article, I had no clue that bullet journaling was such a HUGE thing. I must be living on another planet or something! haha I, myself, am an absolute journaling addict now(along with a gratitude addict, of course) and this nice little hobby has me hoarding every pen, highlighter, japanese planner, stickers, yada yada yada that I can get my hands on. Cha-ching! Thank you, again, for the gift of your words. Our little satellite group now has almost 200 people in it (the main group, Attitude of Gratitude with Chronic Pain, has 3000.) Many of our members had to give up hobbies that they enjoyed for years because of their disabilities. Many of us can no longer do the physical things that we used to do and it can get very depressing at times. In my group, we try to turn everything around to see the positive, so bullet journaling is something almost anyone can do in some way. I have members who say that this is the best thing that has happened to them in YEARS…..can you imagine that? This new interest has sparked hope and given new spring in the step of many people who struggle daily with pain. Jessica, whether or not this new movement and group would have happened without me reading your article, I guess we’ll never know. But the fact is….it did. I hope that you hold that in your heart and know that you’ve helped to give hope and light in the eyes of some people who lost it a long time ago. All with the power of the word. How does the mood tracker work? Main feeling at b’fast/lunch/dinner? Pingback: La magie de la gratitude - Pimpe Ta Vie !